General Motors says it will add 2,500 jobs at a Detroit-area plant that now makes the Chevrolet Volt electric car. The company plans to invest $69 million in the Detroit-Hamtramck (Ham-TRAM-ick) factory and add two shifts of workers so the plant can make the new Chevrolet Malibu midsize car and the Impala large sedan. Not all the jobs will be new hires. GM has about 1,300 laid-off workers waiting to be recalled in the U.S.
GM announced on May 10 that it would create or keep about 4,000 jobs by investing $2 billion in 17 factories in eight states. So far the company has announced expansion plans in Bowling Green, Ky., Toledo, Ohio, and Flint and Bay City, Mich.
GE Capital is gusting 1,000 new jobs into the Windy City, and they’re looking for a mix of skilled commercial, technical and regulatory positions that will primarily support GE Capital’s diversified financing solution interests, serving consumers and companies of all sizes. Finance is a huge part of GE’s business, and more, mostly white-collar workers are needed to take care of its rapid growth. 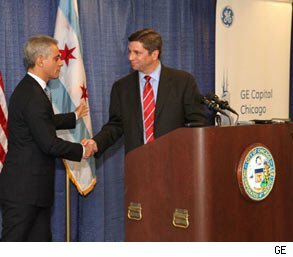 The jobs will about double the number of employees GE Capital has in the are, making Chicago GE Capital’s second largest location, with an employee base of over 2,000 people. “Chicago has been a great market for GE Capital in a number of ways. The City and surrounding areas are home to many thriving, main street companies we serve as customers. Currently, we have $5.4 billion outstanding for over 11,000 customers in Illinois,” Dan Henson, president and CEO of GE Capital, Americas, said. “Chicago also offers a deep pool of financial services talent we can draw upon to help serve our customers in the area and across the country,” he added. To find out more about these jobs, you can visit GE Capital’s career website. From manufacturing to high-tech, GE has been adding new jobs at a rapid clip — more than 6,500 since 2009 to be exact, including, most recently, manufacturing jobs in Fort Worth, Texas and Flint, Michigan; transportation jobs in Texas and Pennsylvania and up to 400 in Virginia, Ohio and New York.